Standard red set boxes as per UK production. (Various designs and sizes). Cardboard tray base, insert and contents were shrink-wrapped. Models now unboxed in the tray insert. Cardboard tray base, plastic tray insert and contents were shrink-wrapped. 1969 - Yellow plastic tray insert - Super 4 Track. 1970 - Greenish-blue plastic tray insert - Super 4 Track. 1971 - Greenish-blue plastic tray insert - System 6 Track. 1972 - Yellow plastic tray insert - Special Set 926 only - System 6 Track. 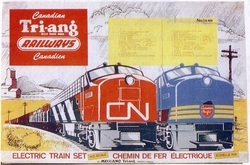 Some sets had large cardboard packing pieces placed over the models. Fold-up one-piece card outer box and card insert. The complete outer box was shrink-wrapped. 'by MECCANO Tri-ang TORONTO CANADA' have been removed. late 1972 - Greenish-blue plastic tray insert. ​1973-1974 - Believed to not to have had a plastic tray insert - models individually boxed with cardboard packing pieces. 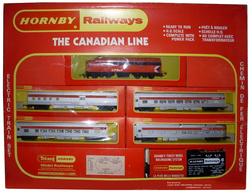 Set contained in window-box - now inscribed 'Hornby Railways'. Red cardboard packing pieces - no cardboard tray insert. Cardboard box base and contents were shrink-wrapped.